Our Powertools product range includes electro- or pneumatically hydraulic tools, which are mainly used in the field of car body machining. The universal technology of the devices allows the adaptation of many attachments for different applications. Depending on the requirements, different tool sets are available, which can be extended as required. 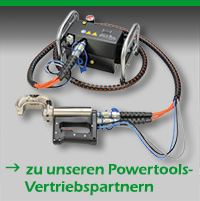 On our Powertools website you will find further information about our products as well as the contact details of our sales partners for purchasing the devices and a fast accessories and spare parts service. Please contact one of our sales partners for sales advice or service.